Welcome to Door Supply of Florida. As distributors and installers of commercial and residential doors, windows, architectural hardware, and bath accessories we offer our customers hands on support beginning with the initial development process, continuing with detailing of shop drawings and hardware schedules, to the full life cycle of the project. If you are a contractor, owner, architect, developer or exporter and have projects ranging from condos, hotels, restaurants, hospitals, offices, retail space, or rehab projects we look forward to quoting your next project. With over 10 years experience in the South Florida, Caribbean, and Latin American markets, we know the who, what, and where's of the door business. If you need just one door, or a building full of doors, give us a call or drop us an email. No job is too small or too large and no door is too large or too small! 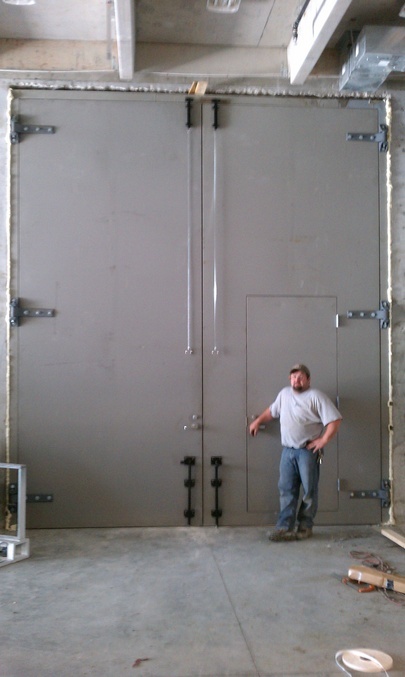 These pair of hollow metal doors measured 12' x 14' and weighed 1,100 lbs. This page and it's contents are the property of Door Supply of Florida, Inc.